UK Financial Investments (UKFI) is the company established by the Treasury to hold the taxpayers’ stakes in RBS and Lloyds. It has been warned to remain “ultra-vigilant” after it was revealed some of the City’s biggest investment banks – including Goldman Sachs and UBS – are charging the government as little as a £1 fee for work that would normally cost tens of millions of pounds. Representatives of UKFI told the Treasury select committee it had paid just £15 for help and advice related to the sale of shares in Lloyds Banking Group and RBS which would normally have cost around £38m. 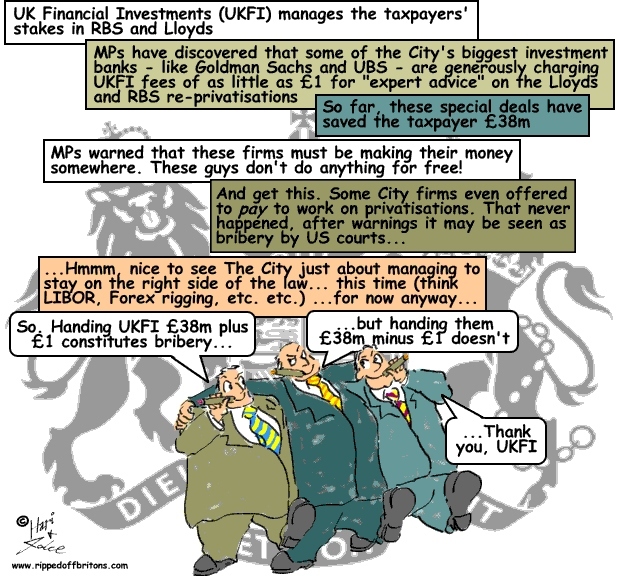 Oliver Holbourn, head of market investments at UKFI, said some City firms had even offered to pay the government to work on its privatisations. The banks, however, eventually concluded that such arrangements could be an offence under the US foreign corrupt practices act. James Leigh-Pemberton, the boss of UKFI, said he assumed the banks worked for £1 because of the caché associated with such high-profile work. But Conservative MP, Chris Philp, warned UKFI to proceed with caution: “I’ve never encountered an outfit like Goldman Sachs or Morgan Stanley acting in a charitable manner,” he said. Steve Baker, another Conservative MP on the committee, said UKFI needed to give clear answers about where the investment banking advisers are making money, given the low fees. “I feel sure that many of my constituents would join me in regarding in the utmost astonishment that the same organisations that have been fined for repeat rapacious misconduct are now the jolly good chaps we imagine from the past and now charging just £1 for their services”. Privatisation of RBS: will the taxpayer get their money back let alone make a profit? Osborne says yes, National Audit Office says no! The government wants you to think we made a profit on sale of Lloyds Bank shares. Actually we made a thumping loss!